Our greatest treasure is our freedom isn’t it? Yesterday we took the afternoon off to enjoy the Atlantic ocean near Zambujeira do Mar. The beach in this picture is far from the main beach and we could only get there through steep rock climbing and swimming around the cliffs. 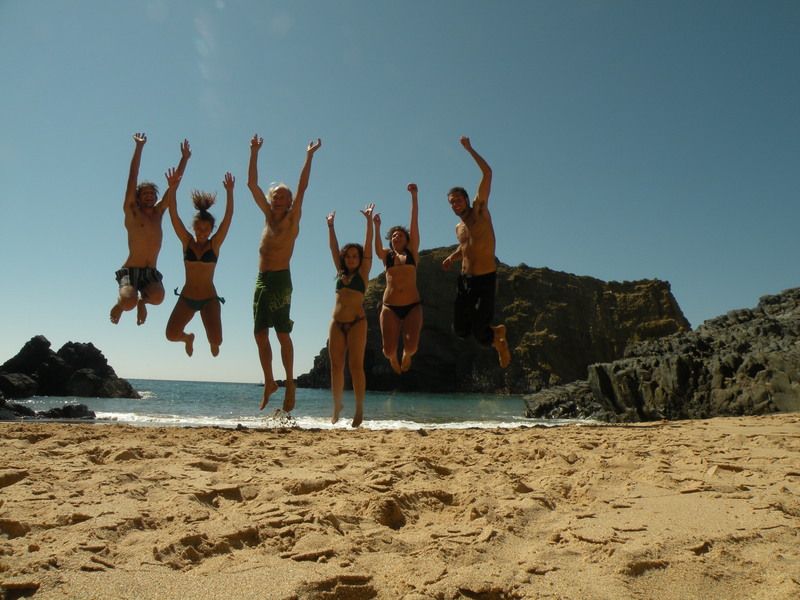 We celebrated the adventure with our new italian friends Angelica, Marilena and Arianna by jumping in the air. Osho! Every morning at 7 am we come together for an active meditation or Yoga, Tai Chi or any other suitable practice. This week Hilde (from Belgium, left in picture) introduced us to the Kriya Yoga practice that she studied in India. It includes a mantra, pranayama, the sun salutation, several other asanas and silent sitting. In this picture also Laura who just arrived from Lisbon, participating for the first time. 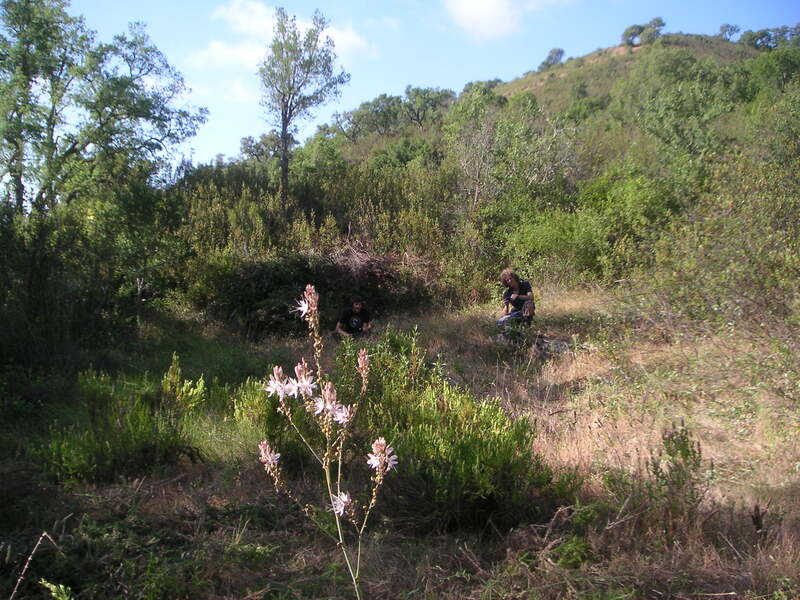 We cleaned this site in the valley of our land with the bushcutter earlier this year to prepare a campsite. I was happy to see there is grass growing now and some beautiful wildflowers. We took plants home for our garden. Next to this area we want to make the first pond, by closing a deep eroded channel with a mass of clay. This pond should fill with ground water and rain. Today, next to the slackline, we installed the Yoga Swing of my son Alexander who arrived yesterday, hitchhiking from Amsterdam. It’s a device for suspension fitness training, aerial Yoga and inversion therapy, consisting of a central sling section and multiple handles. It was invented to treat back and neck pain by traction, using the pull of gravity to decompress the joints. But it’s also good fun and can be relaxing. 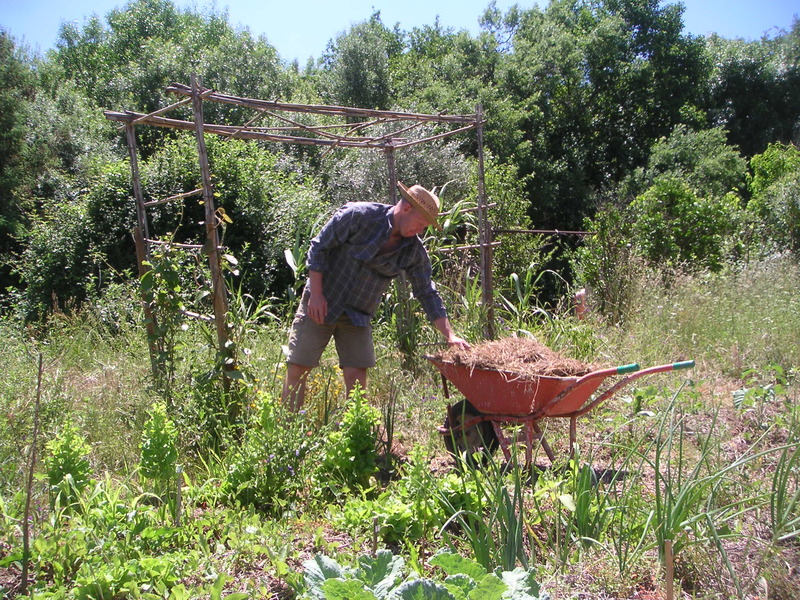 Last year Enn (from Estonia) helped with construction, this time he is covering the garden paths with woodchips and mulching the plant beds. We use mainly chopped grasses and weeds from our own land. Mulch provides an excellent protection from the burning sun, the earth stays moist and soft under its cover. It also prevents weed growth and eventually will compost and provide nutrients for the vegetables. Jochem from Belgium arrived here last month. He and his friends Clemence and Urska who visited for a few days brought a new sport to Osho Garden. They say it is not tightrope walking but more like dynamically bouncing on a very long and narrow trampoline. 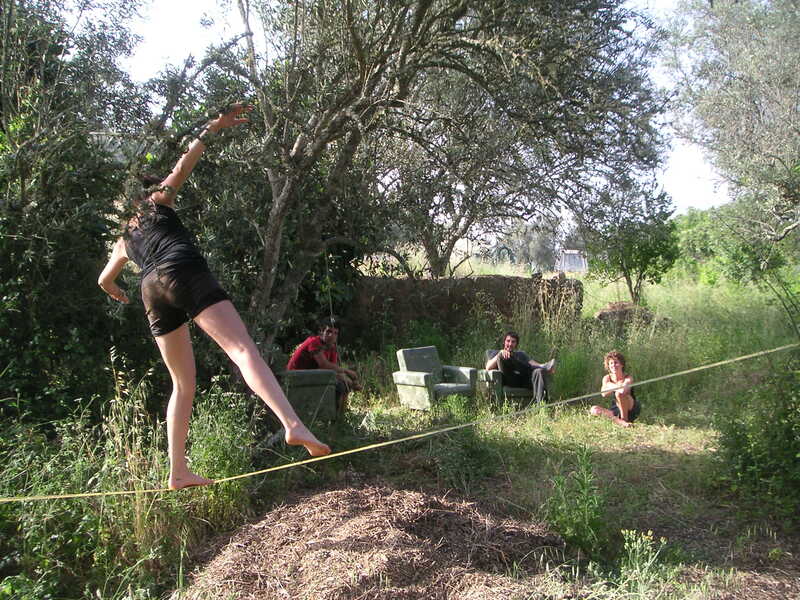 I fell down at the first few steps but they, after just a few months of practice, can bounce happily from one end of the slackline to the other.